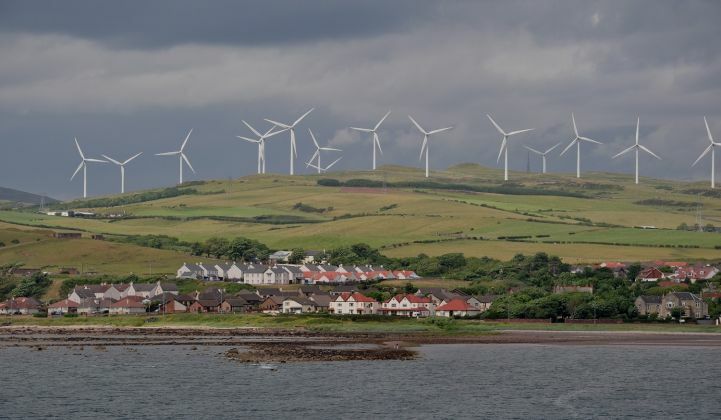 Record-breaking renewable generation in Scotland was cheered by environmentalists last month. But grid planners remain cautious. Wind generation accounted for 46 percent of Scotland’s entire electricity needs in May. “Market design and the existing network are not geared to the level of flexibility and adaptation that is required" in the country, said Aris Karcanias, co-lead of the clean energy practice at FTI Consulting. "We are challenged as we're dealing with a system imbalance between generation source and demand pool, an aging grid, generation at the distributed level, a lack of transparency in data, and an uncertain regulatory framework often distorted by intervention," said Karcanias. Karcanias said the need to upgrade the grid is becoming “a meaningful issue” in places such as Scotland where renewable energy penetration is climbing steeply. Andy Bradley, director at Edinburgh-based Delta Energy & Environment, said news of renewables’ record contribution to the Scottish grid is “fantastic” -- but cautioned that “it’s only one part of the puzzle." "A lot of other things need to happen," he said. Advances in power electronics and data analytics tools, including improved weather forecasting techniques, mean it is now possible to plan and deal with the power quality and reliability challenge caused by increasing renewables penetration, he said. But current legislation is mainly focused on simply procuring renewable generation at the lowest possible levelized cost of energy (LCOE) and securing dispatchable generation services. LCOE does not account for the value of trying to match electricity generation with demand, which is particularly important for renewables. And the lower the costs, the more it encourages the integration of intermittent renewables onto the grid. “This results in an increase in the system LCOE -- the integration costs which the system operators need to manage, according to Karcanias. In the U.K., raising renewable penetration above 20 percent could lead to problems if there are no upgrades to the system or changes in the market design, Karcanias warned. Nevertheless, the Scottish experience demonstrates how existing grids can handle much higher levels over short periods. According to an analysis by the World Wide Fund for Nature (WWF) of data provided by WeatherEnergy, Scottish wind power output jumped by nearly 20 percent in May over same period last year. Wind farms generated enough electricity to supply 100 percent or more of Scottish homes on 11 out of the 31 days in May, the organization said. “The results for May are part of a growing trend of onshore wind increasingly providing Scotland's electricity needs,” Sam Gardner, WWF Scotland’s acting director, told GTM. “As capacity grows and technology develops, there is no doubt renewables will continue to produce the bulk of Scotland's electricity generation. There is significant additional capacity in development, with projects in planning or consented to which now total over 12 gigawatts," said Gardner. Rising levels of variable renewable generation should not be a problem, Karcanias said -- if they are matched by grid infrastructure improvements, more flexible regulation, increased participation of distribution system operators and improved data and energy storage. On grid infrastructure, there is a growing requirement for network capacity and increased interconnectivity, as well as improved generator and consumer information flows. Regulation, meanwhile, needs to accommodate advances in technology, enable the participation of storage and account for evolving consumer demands and participation in the energy mix. The good news: Newer renewable energy projects are behaving more and more like traditional power plants. Modern wind or solar farms are increasingly able to improve production forecasts and deliver power quality services that make it easier for them to be integrated into the grid. System operators are also well aware of the challenges presented by increasing renewable penetration, and are actively working on measures to deal with them. A Scottish parliamentary committee published a report in February concluding that the grid could function without existing nuclear or thermal plants. “The existing network, plus the reinforcements that are coming, will be able to meet the energy demands in no-wind, high-wind, low-water and high-water scenarios,” said Julian Leslie, head of electricity network development at National Grid. In essence, said Karcanias: “The capability of renewables needs to be improved to operate with a more efficient security margin, but I don't believe that in mature markets you're going to experience risk to supply, as adaptation and innovation is happening across the value chain."